A few weeks ago, I decided that I wanted chicken parmesan for dinner. Like, badly. I looooove chicken parm (I sound like a broken record, cuz I know I’ve said that a lot!). In any case, I had not had it in awhile, so I was jonesing. 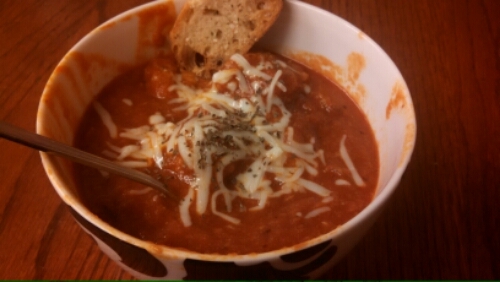 However, it was also a dreary day outside, so I was also thinking it would be a perfect day for soup. Warm, comforting, relaxing, homemade soup. Mmmm. But then the most amazing thing happened. 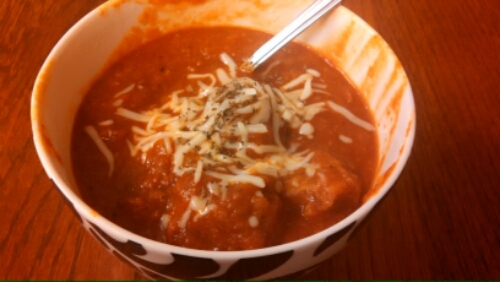 I went onto my “Chicken Dishes” Pinterest board to look for chicken parm and I found Chicken Parmesan Meatball Soup by Chocolate Moosey. Seriously. Chicken Parm + Soup = I died and went to Heaven. Again, SERIOUSLY – the most genius idea in the world. 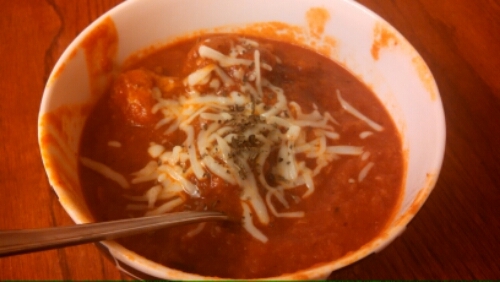 My husband was joking that it was like eating chicken meatballs in marinara sauce for dinner. Ours was probably quite a bit thicker than the original recipe, as it calls for canned crushed tomatoes, and I just used canned tomato sauce. I don’t like chunky tomatoes, and I could have blended the tomatoes, but that felt like an extra step. However, now that I think about it, it probably would have been a thinner soup had I done that. Also, I know that it is pretty ingredient-heavy, but the good news is that most of the ingredients are things you already have in your cabinets! Also, don’t do what I did and almost forget the cheese at the end – I had started to dish it up in our bowls, then was like I FORGOT THE CHEESE, and dumped them back into the pot. That’s really how my mind works sometimes, haha. In related news, sorry for posting 3 pictures of essentially the same thing. I didn’t take any preparation pix, so I figured I’d over-compensate this way. Also: this would have been great with some pasta, too! -In a small bowl, add 1/4 cup panko/corn flakes, then in a large bowl, mix together the chicken, onion, garlic, parmesan cheese, salt, remaining 1 tablespoon panko, basil, and parsley. -Make one inch meatballs (mine might have been bigger), then roll them into the panko. Keep them refrigerated on a tray while you make the soup. -In a large Dutch oven, heat the oil and butter on medium-low or medium until melted. Add the onion and cook until soft, 5-8 minutes. Add the salt, pepper, basil, oregano, thyme, paprika, garlic, and tomato paste. Stir all together and cook another 5 minutes. Add the tomatoes and 2 cups broth. Bring a boil then turn down to a simmer and cook 30 minutes. -Add the soup mixture to a blender and puree until smooth (FYI – I skipped this, because it seemed like too much work, as I would have had to do it in batches, and then it’d also be more dishes to wash, and I was so happy with the result). -Add back to the pot with the remaining 1 cup broth and bring to a boil. -Once boiling, add the meatballs. Cook 7-10 minutes or until the meatballs are fully cooked (now this was actually a bit tricky – I had more meatballs, most likely, because I used more chicken – also be careful, as I had to cover the pot at this point, since everything was popping, and sauce/broth was getting everywhere, including on me, which kinda hurt! Every so often, I would lift the lid just far enough to stick a spoon in to stir/rotate the meatballs, but not enough to let the sauce pop on me and all over the stove). -Stir in the cheese until melted. Serve in bowls and garnish with extra mozzarella cheese.